I was in Budapest, Hungary for the last day of a conference for one year “STINTers” with Cru, about to depart for their assignments for places throughout Europe. 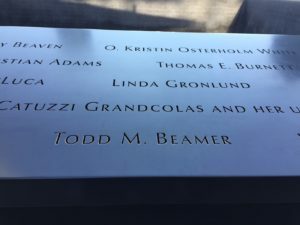 I had just returned from a last minute shopping trip to bring something home to my wife Kim, and I was met at the lobby of our hotel with the words – as best I can recall, “something is happening at the World Trade Towers. They are on fire…planes flew in to them…its on CNN.” Over the next several hours we watched unfold what we all know now. We prayed that night at what was to be a commissioning service, and put on hold their departure until we knew more if this was only a US attack or part of a broader global strategy yet to unfold. It felt different than any meeting I’ve ever been too. Anxiety and uncertainty filled the room, even as we prayed for families affected by the attacks. Some of us had friends and relatives who worked in the Trade Center – we all went to bed that night wondering if they had survived. Parents back in the US were calling us, wanting to know their kids were safe in Budapest. We were all thrust into a new world of shock and uncertainty. A co-worker and I spent the next 4 days living in a staff members basement, checking each day to see if flights were back on to the US, which had all be grounded indefinitely. It was so odd to not know if we were looking at days, weeks, or months before we could return. Back home, I called and reassured Kim we were fine. And she told me the same. Both of us were only partly honest. We were both shaken to the core. I wrote in my journal – “The world has dramatically changed’. How much that was true would only unfold more and more as the years have gone by. I was booked on Lufthansa back to the US, and got a seat on a plane on Saturday night to Frankfurt. Then I showed up at the airport for a flight to Chicago Sunday morning. As I walked up to the Lufthansa check in, the airport was the quietest I had ever heard. If people spoke at all, it was only in hushed tones. Everyone was polite, we all helped each other … there was an understood bond in every line, which was incredibly long that day. Every piece of luggage was opened and checked. New rules were being made up on the fly to protect against any possible repeat attack. The “full” flight, where I was told I got the last seat on the plane, was only half full. All of us were happy to be on our flights – I think most of us were headed home with those visiting the US postponing their flights. We flew home, and it felt like everyone held their breath for 9 hours. I’ve never seen the flight attendants more kind, as if to say for 9 hours, “we’re sorry for what has happened to you…to all of us.” There was a massive exhale followed by clapping as we landed. I remember some tears and chills all came at once. The airport was practically empty as we passed through baggage claim into the terminal. My flight was one of the first international flights allowed back in to the US. I lived in Indianapolis at the time, so I should have had a connecting flight. But as it turned out, my daughter had a soccer tournament in the Chicago suburbs somewhere…I don’t even remember where. And so, Kim picked me up that day at the international terminal. Ours was one of only 2 cars present – right in front of the terminal of one of the world’s busiest airports. The other was a police car. The family minivan never looked so good. 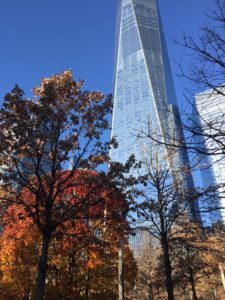 I went to One World Trade Center this past December, my first time there since it had been completed. I definitely felt like I was on sacred ground. Several times I teared up as I recalled what took place on that blue sky morning. It took me back to those first days, and thinking of the heroes – firemen, police, first responders, and the brave men and women who sacrificed themselves in the sky over Pennsylvania to save The US Capital or the White House. They were the first citizen soldiers in a very real war being waged against our country. Lives lost, and lives saved. A defining moment of this generation. And while so much is different, not everything is. And among the things that are the same: sacrifice for the sake of others still counts. There are clearly people who want to kill or harm the USA in any way possible. Not very many really, but today unlike past wars you don’t need very many to strike a large and deadly blow. So thank you to the thousands of men and women who have sacrificed themselves – many losing their lives or suffering great physical and/or emotional injury – for this country to be a little safer for the past 17 years. It is hard to imagine what you and your families have voluntarily endured for the sake of our freedom and protection. We all owe you a debt we can not repay. Thank you. Thank you. Thank you.